I came up with a greight idear to make alot of money. It's a purfume and coloan that makes you smell like bacon. Doesn't that sound like a good idear? I know, its gonna be huge. I'm sure that there are a few of y'all that are thinkin that this particular Jethro Enterprizes venture is not one of his better ones. You maybe sayin, "Jethro, I'm sure some folks won't want to smell like bacon and it maybe offensive or harmful to some." Don't you worry, I've got it all covered. I'm gonna put a warning label on every bottle. It will say: Don't wear this bacon scented colonge if your a mailcarrier cuz it may attract dogs. I think all of my bases are covereed. Who wants to accept a great investment oppourtunity? 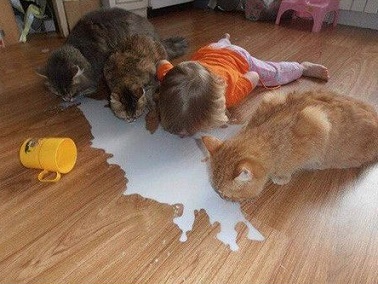 "One of these things is not like the others..."
No crying over spilled milk here! Should never have named her Kitty. 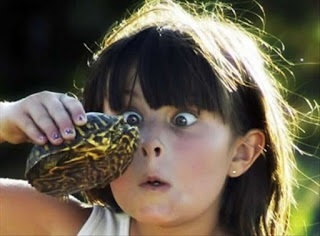 If you can't lick 'em, JOIN 'em! "Help me quick, before Mom gets back!" That kid was definitely raised by cats. See? I told you my mom's floor are so clean you can eat off them.